Figure 3. Image of Rev. Thomas Ware. Governor John Sevier was furious when the news of Pugh’s seizure reached him days later. His anger was based upon his feud with Colonel Tipton, and that Pugh’s actions violated the Franklin Act that was passed in March of 1787. This legislation stated that any person attempting to perform any official act under North Carolina authority was subject to punishment. Sevier decided to march upon Colonel Tipton’s cabin and raised a small force of loyal Franklinites in Greeneville (the state’s capitol). Some loyal Franklinites joining the march were met by Reverend Thomas Ware before reaching Greeneville. He tried to persuade them not to take part in the conflict, but the armed men believed him to be a friend of Colonel Tipton. 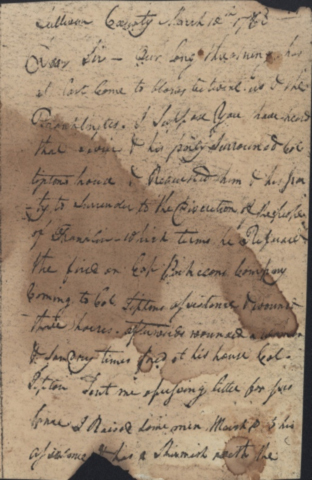 They planned to seize and send him to Governor Sevier to be tried as a spy, but Ware narrowly escaped the armed men by saddling his horse in the middle of a bitterly cold night and traveled through the night, letting his horse guide him to a friend’s home nearby. Figure 4. 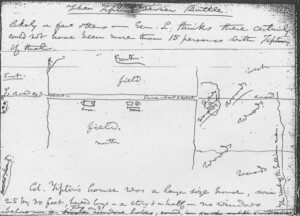 Map drawn by nineteenth century historian Lyman C. Draper of Col. Tipton’s property during the Battle of the State of Franklin. This map was drawn from the memory of Thomas Love, younger brother of Major Robert Love, during an interview with Draper. Col. Tipton’s house is visibly marked, along with Gov. Sevier’s position in the woods. On February 27, 1788, Governor John Sevier and his force, numbering over 100 men, arrived at Colonel Tipton’s cabin. They positioned themselves a few hundred yards from his house and set pickets up along Colonel Tipton’s property. Colonel Tipton was now surrounded in his cabin with only his family and a handful of supporters. Martha Denton Moore Tipton, his wife, must have been troubled by the possibility of bloodshed or the arrest of her husband by Sevier and the fear for protection of her eleven and five year old sons of Jonathan and Abraham. Several of Colonel Tipton’s older sons were also there to support their father. With tensions heightened on both sides, a unique incident occurred shortly after the firing ceased between Captain Parkinson’s company and Sevier’s sentinels. 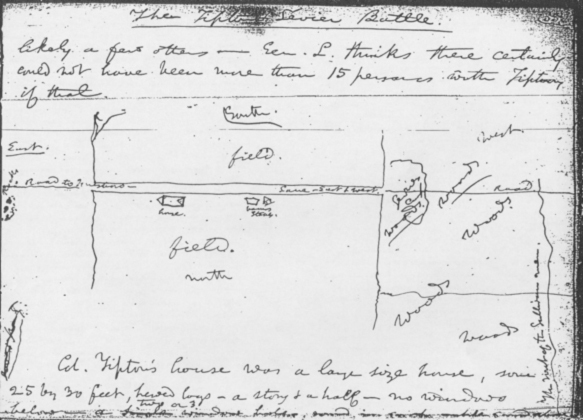 Described best in Colonel Tipton’s deposition, “Two young women passing by near to the still house before mentioned were fired upon from which firing one of them received a bullet through her shoulder.” The women that were fired upon were not named and, unfortunately, there is no source that documents whether the wound was fatal or not. The next day, February 28, Governor Sevier sent another flag of truce to Colonel Tipton requesting his surrender. Colonel Tipton replied boldly this time, “To this flag I sent an answer, letting the men assembled there know that all I wanted was a submission to the laws of North Carolina, and if they would acquiesce with this proposal I would disband my troops here….” Realizing that Colonel Tipton and his small party were not going to surrender, Sevier decided to lay siege to Tipton’s cabin instead of causing any bloodshed by assaulting the cabin. Figure 5. Page 1 of 2 of a letter from Col. Tipton and Col. Maxwell to Col. Arthur Campbell. The letter, dated March 10th, explains the recent conflict between the Tiptonites and Franklinites. After sneaking out of Tipton’s cabin on the night of the 27th, Major Robert Love had joined with his brother, Thomas Love, in raising a small party to reinforce Colonel Tipton. On the evening of the 28th, Major Love’s party had reached the outskirts of the Tipton property. Fearing possible detection from Franklinite sentries, Major Love volunteered to check for a possible path around. He soon found that the Franklinite sentries had left their post around the cave due to the bitter cold weather. Major Love quickly went back and told his force that the path was clear and they safely dashed to the cabin. The fight was brief, but conclusive. After roughly ten minutes of fighting, Governor Sevier and his men retreated back to Jonesborough, while several men were captured and wounded on both sides. The causality rate of the battle was low and is best explained by a loyalist, Dr. Taylor, who stated that neither side wished to kill each other. Instead some men were poorly or not even armed and did not even load their guns. According to Dr. Taylor, Colonel Tipton’s men shot in the air while Sevier’s men shot at the corners of the cabin. Three men were killed, though, as a result of the battle, two being North Carolina loyalists and one Franklinite. North Carolina sheriff, Jonathan Pugh was mortally wounded in the chest and died several days after the fighting. Colonel John Tipton and his men pursued after the fleeing Franklinites. In their pursuit, the loyalists were met by Robert Young, Jr., who delivered a verbal message from Governor John Sevier to Colonel Tipton and his officers. Sevier asked Tipton for time to consider terms and Colonel Tipton replied by allowing him until March 11 to submit to the laws of North Carolina. Governor Sevier and the Franklinites held a council to consider their options and on March 3, Sevier sent the council’s results to Colonel Tipton – Sevier’s term as governor had expired two days earlier and therefore he signed the document as only the president of the council. The Franklin council wished for peace, but did not comply with Colonel Tipton’s request to submit to the laws of North Carolina. As the State of Franklin’s existence began to diminish, tension still prevailed between the Franklinites and Tiptonites. The men captured during the battle were released, but it is unknown what exactly happened to Sevier’s confiscated slaves, except for one. 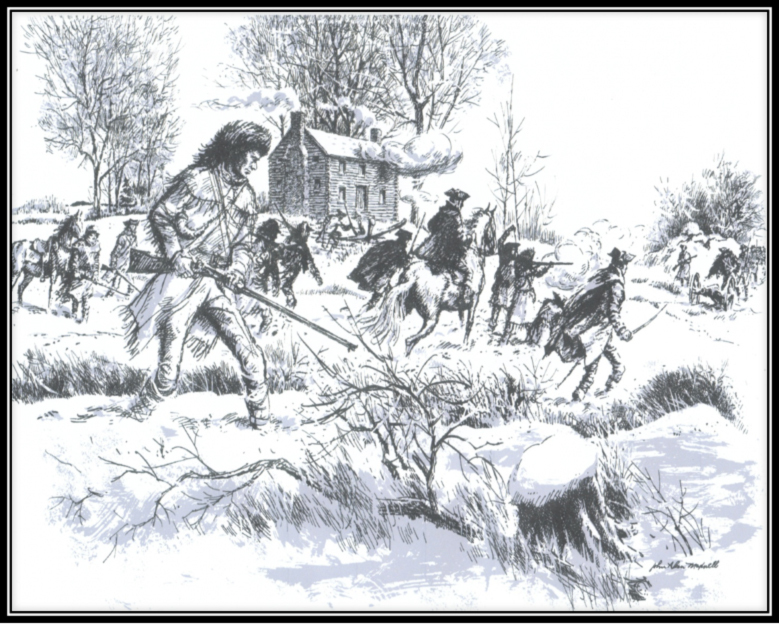 A male slave by the name of Tobe saw a chance to escape after the battle while the loyalists around the Tipton cabin were in confusion guarding the captured Franklinites. Before being detected and stopped, Tobe mounted a horse and dashed off the Tipton property. He eventually made his way back to Sevier. I afterward met a number of these men returning without their arms, and among them some whom I had admonished not to go, and was strongly inclined to remind them of the admonition I had given them; but I concluded that they were sufficiently mortified already, and that it might only arouse their indignation against me, so I let them pass. Figure 6. John Alan Maxwell’s depiction of the February 29, 1788 Battle of the State of Franklin. Maxwell, 1904 – 1984, was a native of Johnson City, Tennessee and a prominent mid-twentieth century artist. John’s brother, Clifford Maxwell, was a charter member of the Tipton-Haynes Historical Association and a well-known photographer. J. G. M. Ramsey, The Annals of Tennessee, (1853; repr., Kingsport, Tennessee: Kingsport Press, Inc., 1967), 414. Clark, The State Records of North Carolina, 22: 714. 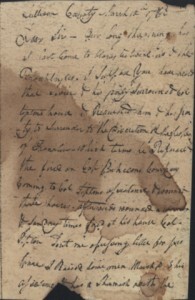 John Tipton & George Maxwell to Col. Arthur Campbell, March 10, 1788, Mary Hardin McCown Collection. Deposition of Colonel John Tipton & others, Mary Hardin McCown Collection. Clark, The State Records of North Carolina, 22: 692. Draper Manuscripts, Wisconsin Historical Society, Madison, Wisconsin. Ramsey, The Annals of Tennessee, 412. Thomas Ware, Sketches of the Life and Travels of Rev. 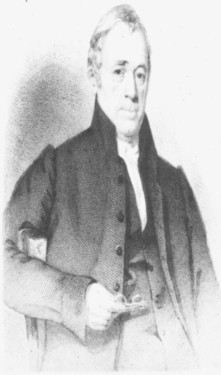 Thomas Ware, Who Has Been an Itinerant Methodist Preacher for More Than Fifty Years, ed. T. Mason and G. Lane, (New York: J. Collord, Printer, 1839), 150.